The summer vacation season is traditionally a boon for the airline industry. But South Korea’s major airline companies are far from cruising, as their stocks have been plunging along with their brand power due to personal and business irregularities allegedly committed by the owner families. Asiana Airlines, one of Korea’s two major air carriers run by the Kumho Asiana Group, has seen its shares plummet since the recent “no-meal” fiasco erupted, jeopardizing the firm’s standing and igniting protests from employees. Shares of Asiana Airlines closed at 4,120 won ($3.70) last Friday, marking a 32.5 percent price drop from a high of 5,460 won logged around five months ago on Jan. 29. During the period, around 275 million won was wiped away from its market cap. Asiana’s “no-meal” crisis involves a number of suspicious contract signings and business decisions, namely the background of its decision to terminate its contract with longtime in-flight meal supplier LSG Sky Chefs. Also in question is an allegedly unfair short-term contract between Asiana and a smaller supplier called Sharp Do & Co Korea that was sealed with strict conditions, despite the contractor’s apparent lack of capacity. 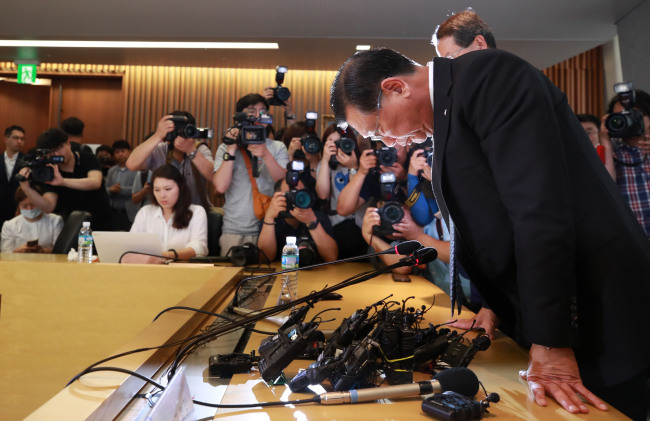 Public criticisms against Asiana flared up with other allegations of power abuse and favoritisms that followed, including an outdated video clip showing female employees practicing a welcoming song for its Chairman Park Sam-koo. Outraged by the turn of events, Asiana Airline workers held a candlelight vigil last week and planned for another one on Sunday. 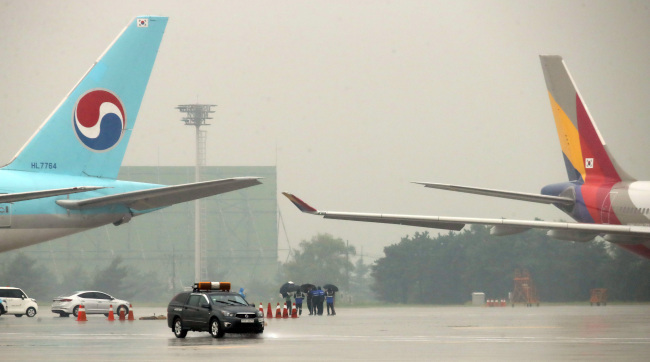 Korean Air, the country’s biggest airline operated by the Hanjin Group, is currently embroiled in its own controversy which began prior to the ongoing scandal at Asiana. Shares of Korean Air and related companies have been plunging in value since the “water rage” incident by Cho Hyun-min, the youngest daughter of Hanjin Group Chairman Cho Yang-ho, led to a series of government and prosecutorial probes into the Korean Air Group and its businesses. 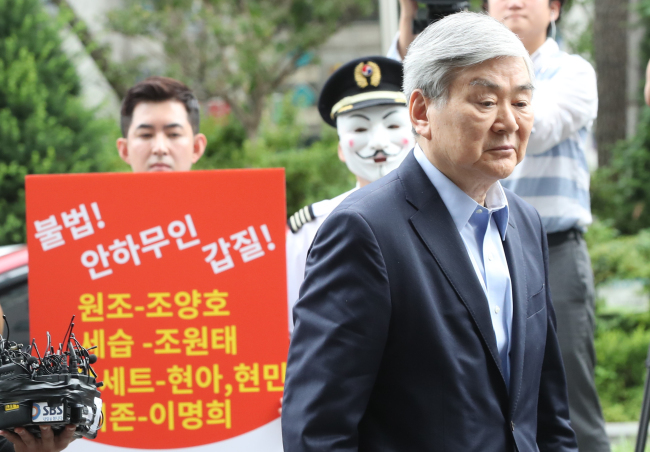 Korean Air’s budget affiliate Jin Air faces the possibility of a business license revocation, while prosecutors have charged Hanjin Chairman Cho Yang-ho with alleged tax evasion worth 50 billion won and embezzlement worth 20 billion won. The incidents have taken a major toll on Korean Air’s stock price. Prior to the “water rage” incident, Korean Air shares stood at 35,900 won on April 11. But as of last Friday, the shares were priced at 27,950 won, marking a 22.14 percent drop in value and 754 million won in market cap wiped off the map. Shares of related companies including Hanjin Kal, Jin Air and Korea Airport Service have all posted two-digit percentage drops in their value amid investor concerns and rising regulatory risks. On top of managerial woes, the Korean carriers are said to be facing general market difficulties as well. Rising oil prices and a weak won have strained finances, while the number of Chinese tourists to Korea, a longtime profit contributor, has remained stagnant. In the wake of continued risks involving the family-owned management at Korea’s top conglomerates, institutional investors are now facing pressure to do more to improve corporate governance at the invested firms. The Korean Stewardship Code, established in December 2016, encourages institutional investors to exercise their voting rights and be more actively involved in the key business decisions at the companies they invest in. The guideline aims to help ease the “Korea Discount” that often leads listed Korean firms to be undervalued compared to their global peers due to geopolitical risk, low dividend payouts and poor corporate governance.